Hellyeah have shared a video for 333, the first track to be shared from their last album recorded with late drummer and founding member Vinnie Paul. "Vinnie originally came up with the idea for 333. A lot of people may think Vinnie was just a drummer, but he was much more than just a badass, slamming, smashing drummer. He understood production and composition and he was very much a contributor to the writing process. This song was his baby; it belonged to and came from him. Unfortunately, by the time I was ready to actually write the lyrics, it was after Vinnie had passed. The lyrics embrace and recognize the feelings that most metal fans have. Being treated like outcasts and being judged for the way we look or dress. It's a reminder to all the metal fans that no matter what, you will always have a place in our worldwide metal community. With that said... Welcome to the family! We're all the root of half-evil-reppin' 333!" Vinnie Paul Abbott passed away in June 2018. Not long before his death, he laid down drum tracks for album number six with the new song referencing the fact that number three was loved by Abbott's brother, late Pantera guitarist "Dimebag" Darrell Abbott. Hellyeah recently confirmed a one-off special concert to celebrate Vinnie Paul on May 11 at the House of Blues in Las Vegas. A portion of each ticket sale will be donated to the American Heart Association. 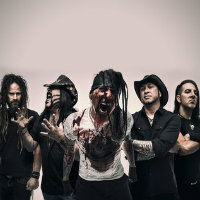 Click here to compare & buy Hellyeah Tickets at Stereoboard.com. Hellyeah will bring their Unden!able tour to the UK in spring 2017. Hellyeah, which features ex-Mudvayne vocalist Chad Gray and ex-Pantera drummer Vinnie Paul, have shared their new track, Startariot. Hellyeah have announced they will return to Australia and New Zealand this August.